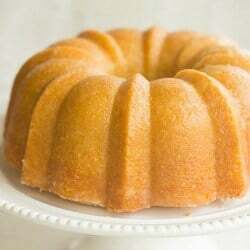 I don’t know about you, but rum cake was a dining room table staple at my grandma’s for as far back as I can remember. It showed up early and often for Sunday dinners and holidays. 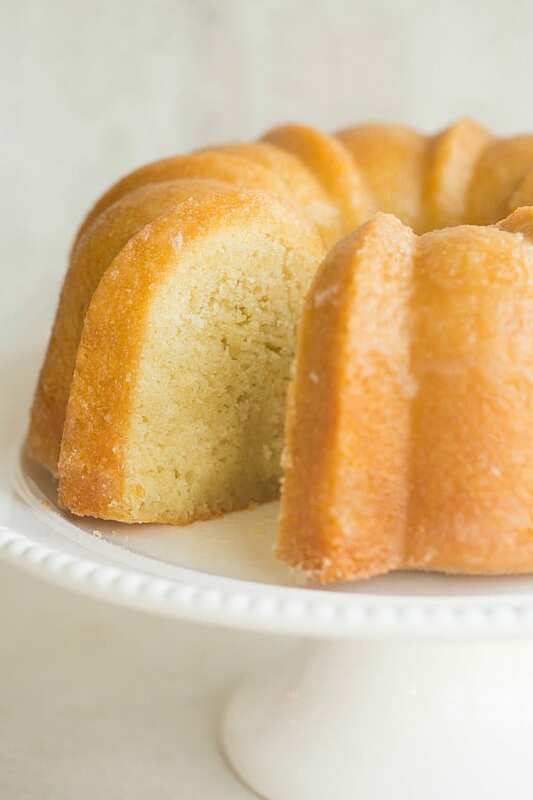 My great aunt was the designated rum cake-maker and to my knowledge, she used a box cake mix and Bacaradi, a recipe which has certainly made its round from index cards to recipe books and now, the Internet. A couple of years ago, I made a homemade version that pretty much knocked everyone’s socks off. My family loved it, and many of you have since made it and shared with me how much your families have loved it. Given the popularity of the rum cake, I had a feeling that bourbon cake would be a terrific follow-up. I saw this bourbon cake nearly two years ago, and subsequently bought the cookbook where it had originated. Once I realized that the Kentucky Derby was right around the corner, I dusted off the recipe and whipped it up using Kentucky bourbon; any excuse to be festive, right?! I don’t need to tell you how fabulous this is, do I? I mean… BUTTER. BOURBON. CAKE. You can absolutely taste the butter in this cake and I mean that in the most phenomenal way imaginable. It’s moist, and absolutely bursting with bourbon flavor. If you’re having a Kentucky Derby party, this is a must for your menu. I also imagine no one would complain if you served it up for the holidays or any other get together where people appreciate cake, butter and bourbon. A wonderfully boozy bourbon cake, much like its rum cousin. Preheat oven to 350 degrees F. Grease and flour a 12-cup fluted Bundt pan; set aside. Sift together the flour, baking powder and baking soda into a medium bowl. Add the salt and whisk to combine; set aside. 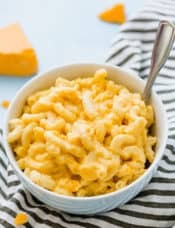 With an electric mixer, cream together the butter and both sugars on medium-high speed for 5 minutes, until fluffy, stopping occasionally to scrape the sides of the bowl. Add the eggs one at a time, mixing well after each addition and scraping the sides of the bowl before adding the next. Combine the buttermilk and bourbon in a small bowl. Reduce the mixer speed to low and add the flour mixture in three parts, alternating with the buttermilk-bourbon mixture in two parts, beginning and ending with the flour. After each addition, mix until just barely blended and stop and scrape the bowl. Stop the mixer before the last of the flour has been incorporated and complete the blending by hand with a rubber spatula. 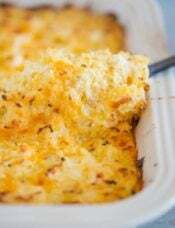 Pour the batter into the prepared pan and spread it out evenly. 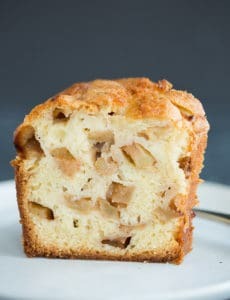 Bake until the cake is golden brown and springs back when lightly pressed with a finger, 40 to 45 minutes. Towards the end of the baking time, prepare the glaze. Combine the butter, sugar and bourbon in a small saucepan over low heat until the butter melts and the sugar dissolves, whisking to combine. Remove the cake from the oven and immediately poke holes all over the top of the cake using a long skewer. Pour three-quarters of the glaze slowly over the cake, allowing it to seep into the holes. Place the cake on a wire rack and cool for 30 minutes, then turn it out onto a serving platter. 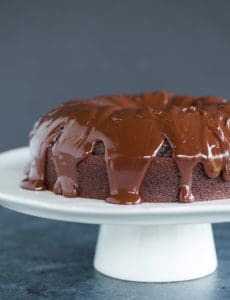 Immediately brush the remaining glaze all over the top and sides of the cake (if the glaze has thickened, rewarm over low heat). Serve the cake warm or at room temperature. 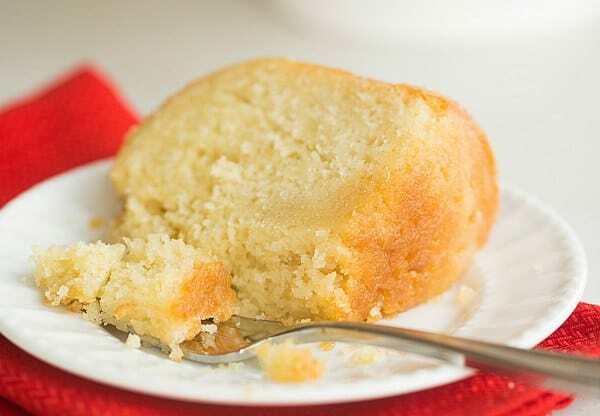 Leftover cake can be stored in an airtight container at room temperature for up to 5 days. I would love to know your secret to getting a light colored cake. I prefer to have my cakes to look like your cake. I have the anniversary bundt pan and my cakes always finish with a darker crust. I just finished glazing this cake. It is tall and gorgeous. I course chopped 1 1/2 cups of pecans and spread it around the bottom of the pan like the rum version. After reading the reviews and seeing that the recommended bake time was only 40 minutes for such a large recipe, I went ahead and added 15 more minutes. I had no issue with doneness… 55 minutes is ok. I used baking spray on the pan and the cake released with no problem. My cake has more color than the picture but just as beautiful. I will be serving it tomorrow…. hope I can wait that long! Definitely a keeper! When I tried making it the outside of the cake was a dark gold, almost brown, and the inside was still raw batter when I poked it with a skewer. I double checked everything and as far as I can tell, I followed the directions precisely. Do you know why the cake didn’t bake all the way through? Is it supposed to be runny in the middle when you poke it? Oh no! It definitely should just come out with moist crumbs attached; it shouldn’t be runny in the middle, it may need a little more time in the oven. Hello, this is the best cake that has ever existed. That is all. I have this cake in the oven right now. It’s overflowed my bundt pan. That’s going to be fun to clean up later. Also, it’s taking a lot longer to bake then suggested. It’s been in over and hour and when I poked it the skewer was not “clean”. Hi Kristen, Oh no! Unfortunately, if it overflowed your pan and is taking a long time to finish, it sounds like your pan was too small. 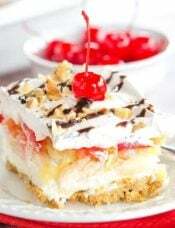 This cake is identical to the one created by David’s Leite at Leitesculinaria.com. Hi Margo, I got it from a cookbook (Vintage Cakes), so perhaps that author got it from him, or vice versa? 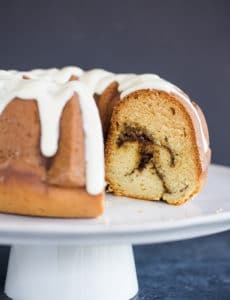 Is possible to not add the glaze at all and still have a great tasting cake? Hi Tania, It will still be good, but you will lose some of the moistness that the glaze imparts. AMAZING CAKE!! 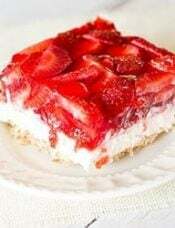 Easy to make, ice and to eat 🤤 Do yourself a favor and make this cake!! This is a fantastic cake! 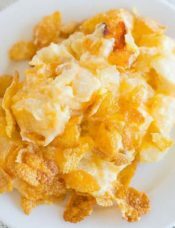 I have made several times and have passed the recipe on to so many people. If you like bourbon this is the cake for you! First let me say that this cake was EXCELLENT and got huge reviews from my co-workers. That being said, I did have problems with it. It overflowed out of my bundt cake pan, although I anticipated this with how full the pan was prior to baking so I put a cookie sheet underneath it in the oven to catch the excess. My total cooking time was an hour, and I think I should’ve gone 5 minutes longer because after removing and poking holes and pouring the glaze, the entire inner circle of the cake caved in on itself. However, you couldn’t see any of that once I flipped the pan after letting the glaze set. I will totally make this again! This cake is AWESOME!! I’ve made it seven times since the Christmas holiday. I’ve made this recipe with three layer 10″ round cakes, a half sheet cake, and loads and loads of cupcakes. I made a few modifications ~ 2/3 cup bourbon, 1 tsp vanilla extract, 1 tsp cinnamon and a 1/4 tsp nutmeg. I made sea salted caramel buttercream instead of the glaze. I then sat back and watched every crumb disappear! My new go-to cake recipe. I have a lot of trouble with this cake sticking to my Bundt pan. I have the Anniversary pan. The first time I thought it stuck because I used regular PAM instead of Baker’s secret. Second time, it fell. This time, I used that super release you make with equal parts Crisco, oil and flour. It still stuck, and I had to use a steam release technique from the Nordic website to get it out in one piece. However several chunks pulled off. 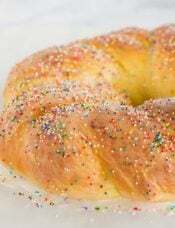 So I am going to make a thin Bourbon buttercream glaze to smooth it out. I poked the holes and spooned the glaze over the holes when the cake was still hot. I tried to turn it out after 30 minutes and it did not want to move so I gave it a bit more time. Nothin worked. 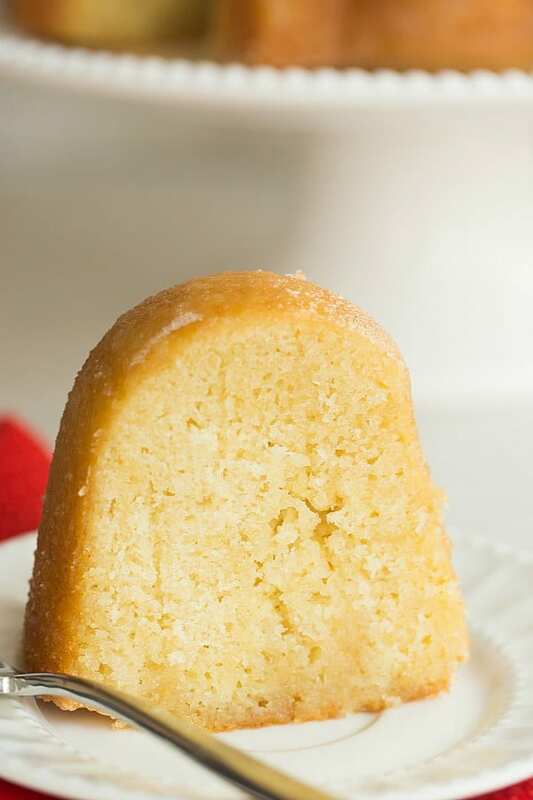 My rum cakes, lemon glazed cake, egg nog cake all use the hole poke a hot cake method and do not stick. Why does this cake stick? 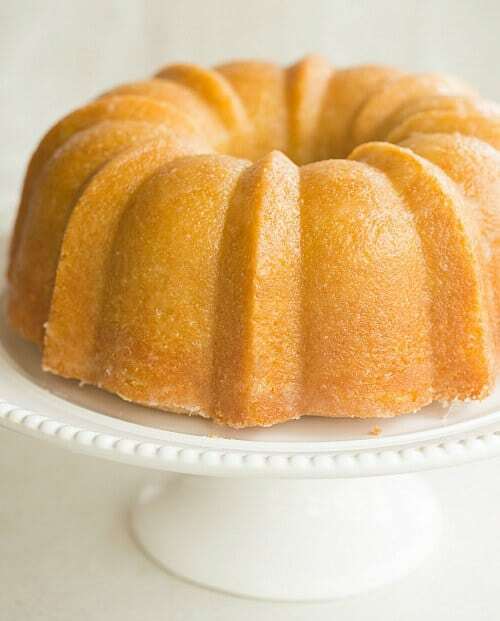 Hi Claire, I have the same Nordicware anniversary bundt pan and I’ve never had an issue with sticking with this cake. I typically grease liberally with shortening, and then flour. I made this cake for Christmas. My family LOVED it. New family tradition was born.